I can’t believe that just a few days ago I was in coastal Otago. Now at the other end of the country we are spending the weekend in the balmy and beautiful Whangarei Heads. However, Whangarei Heads does remind me a little of home on the Otago Peninsula. 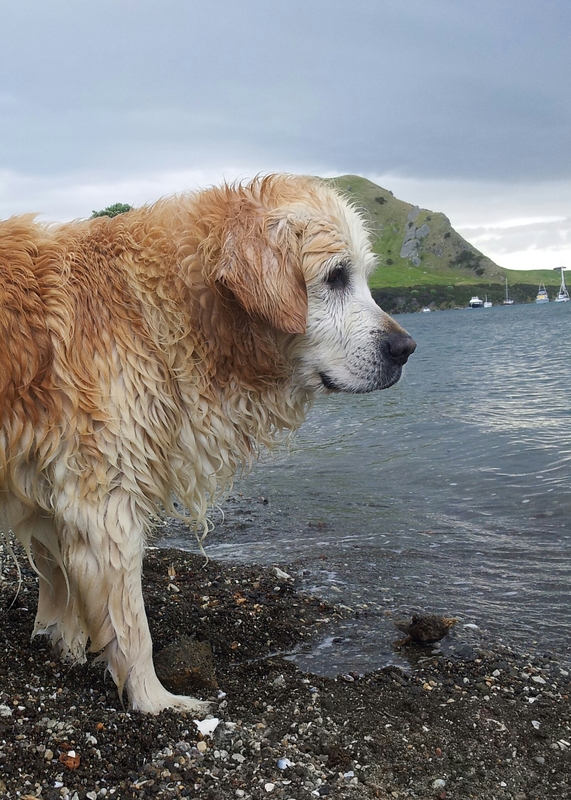 It was a perfect way to complete our summer holiday with our friends Heather and Martin soaking in the stunning views, listening for the sound of kiwi at night and swimming in the clear blue harbour with the company of Kai, a rock diving Golden Retriever. I discovered it’s not only the shape of the land that is familiar to Otago Peninsula. This area has had its fair share of Scottish early settlers too. Unlike Otago and Southland, Scottish settlers here didn’t come directly from the Highlands but via Nova Scotia, Canada. Compared to Nova Scotia I think the Whangarei early settlers must have thought they had arrived in Heaven with the warmth and lush growing conditions of Northland. Little touches of Scotland remain as every New Year’s Eve in Urquhart’s Bay the sound of bagpipes welcomes in the New Year from a boat moored in the harbour. Heather is a wonderful cook. 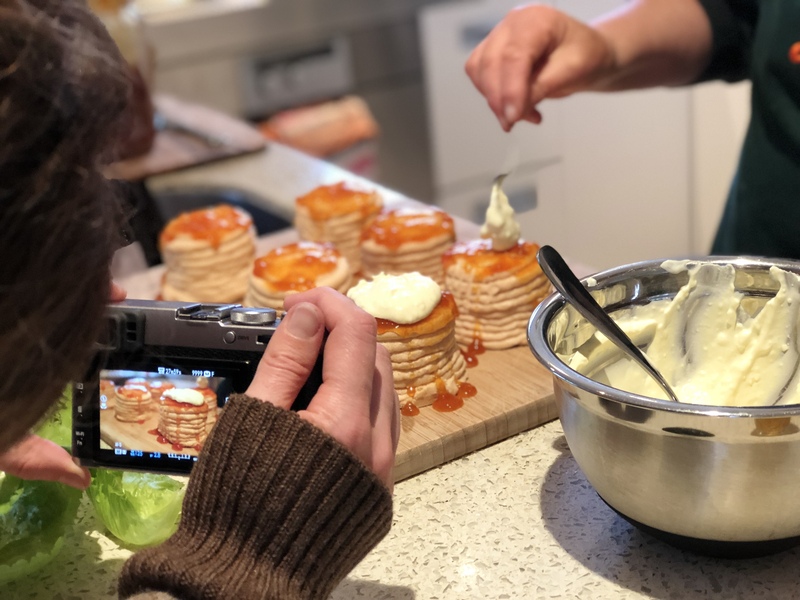 I wanted to bring something delicious and new for the weekend, so we battled with the Auckland traffic to stop in at the Matakana Village Farmers Market. 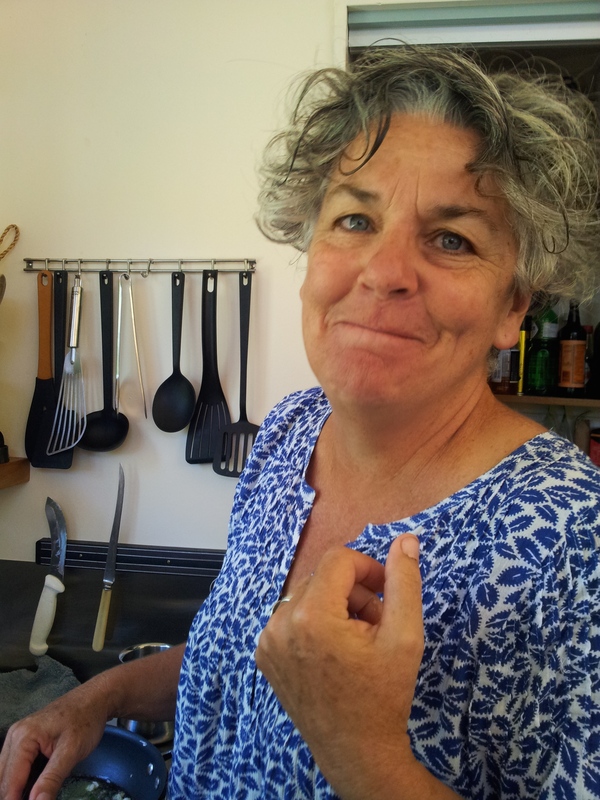 There I met Jo from Whangaripo Buffalo Cheese Company who is passionate about buffalo cheeses and proudly showed photos of the latest arrivals to their herd. 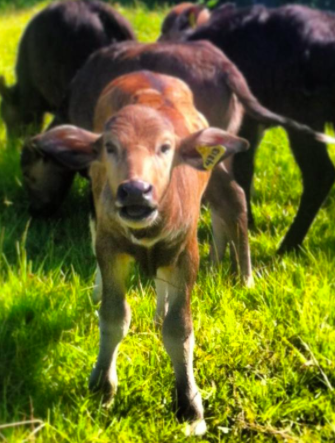 The Whangaripo buffalo stock came from Australia but originated from Italy. This photo is from Jo’s Facebook site. Aren’t they so cute with those large soft ears? Apparently their moos are different from other calves – more like duck calls. 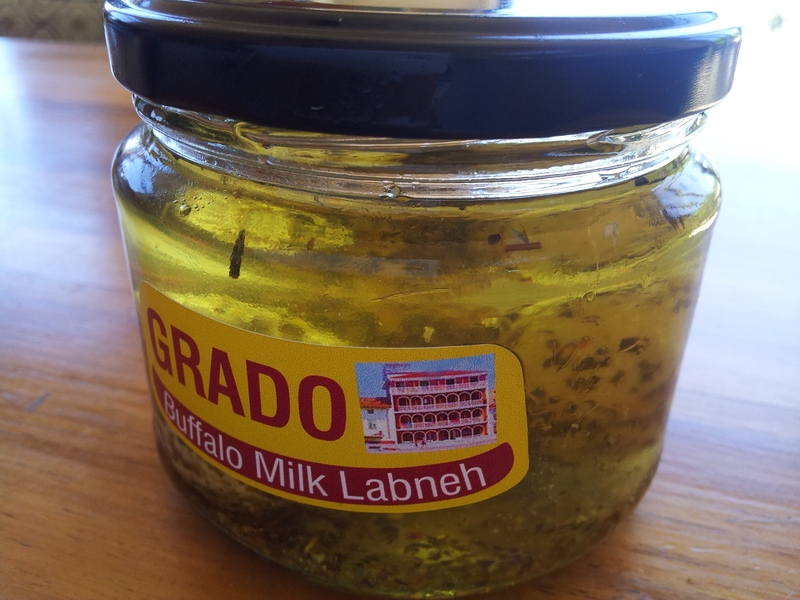 Click on the link above to learn more about the Whangaripo Buffalo and the cheese produced from their milk. That night I offered to make the salad. Heather had assembled a lovely selection of small green and purple coloured lettuce, large leaved rocket, cucumbers and a good quantity of coriander. I cut the cucumbers length wise and scooped out the seeds dicing into 1 cm pieces. This is to avoid the salad becoming too soggy. If I wanted to use tomatoes I could go out and select them. No need to wash them as we had just received a warm downpour courtesy of Mother Nature. 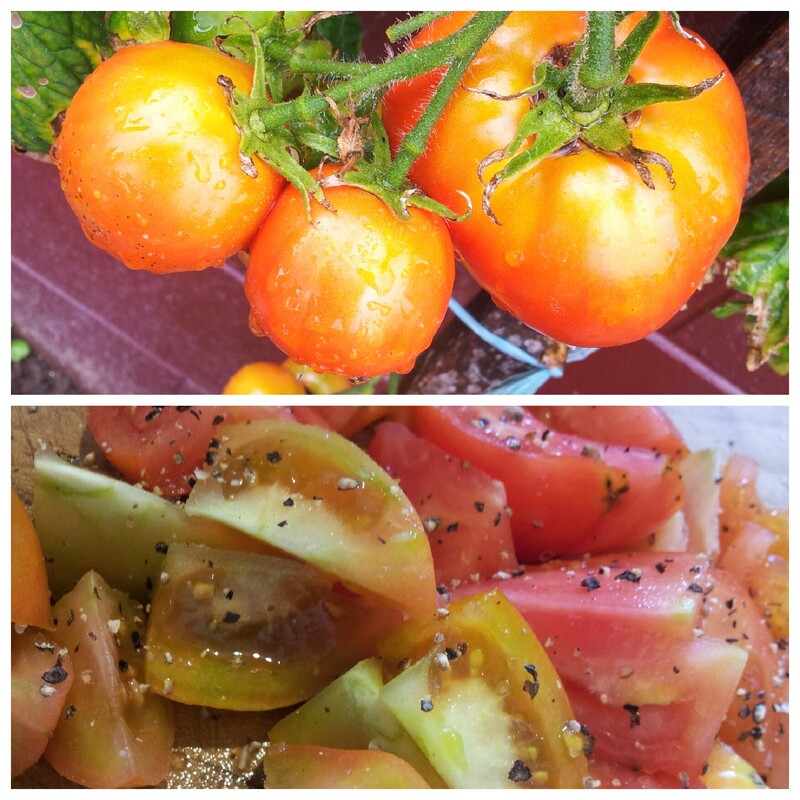 I simply cut them up and seasoned well with salt and pepper before adding to the salad. 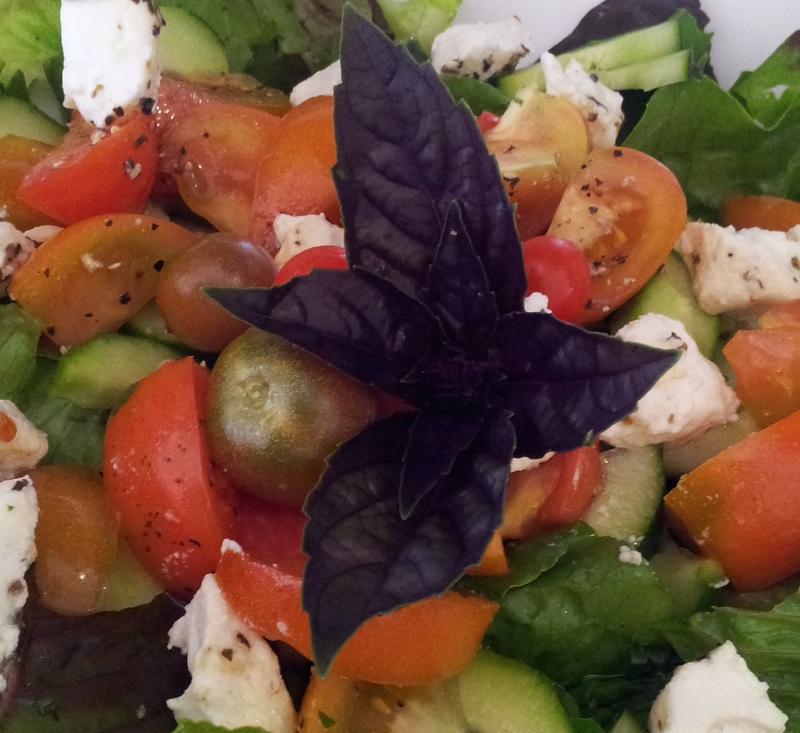 Next I cut up three Buffalo Labneh balls and dotted them on top of the tomatoes and salad greens. Now all these freshly harvested greens, tomatoes and cheese could just have a simple dressing, but I felt with so much coriander and rocket on offer I could make a pesto dressing that would add a real flavour punch. 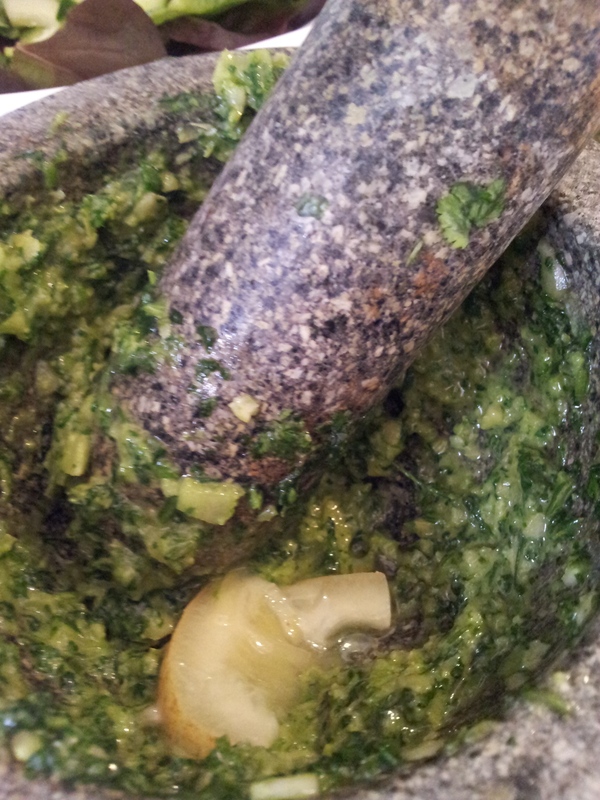 Using a lovely large stone mortar and pestle I first crushed a large clove of mild flavoured garlic with rock salt. Crushing the garlic with salt makes it into a garlic slurry. 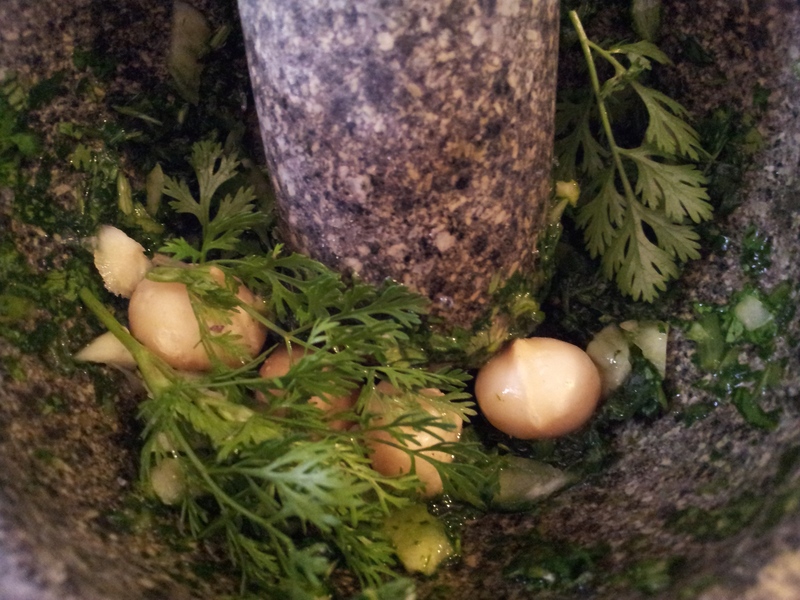 Add a good handful of coriander and 2 or 3 rocket leaves slowly adding olive oil to ensure a paste develops. Now for the nut component: for pesto you can use pine nuts, almonds, hazelnuts, walnuts and even peanuts but Heather suggested I use macadamia nuts. As these nuts are grown in Northland I decided they would be perfect. Their mealiness and mild flavour would be perfect with the strong flavours of coriander and rocket. I found them tricky to crush whole, so I took them out and cut them up before working them into the paste with the mortar and pestle. I usually finish off a pesto with a squeeze of lemon. 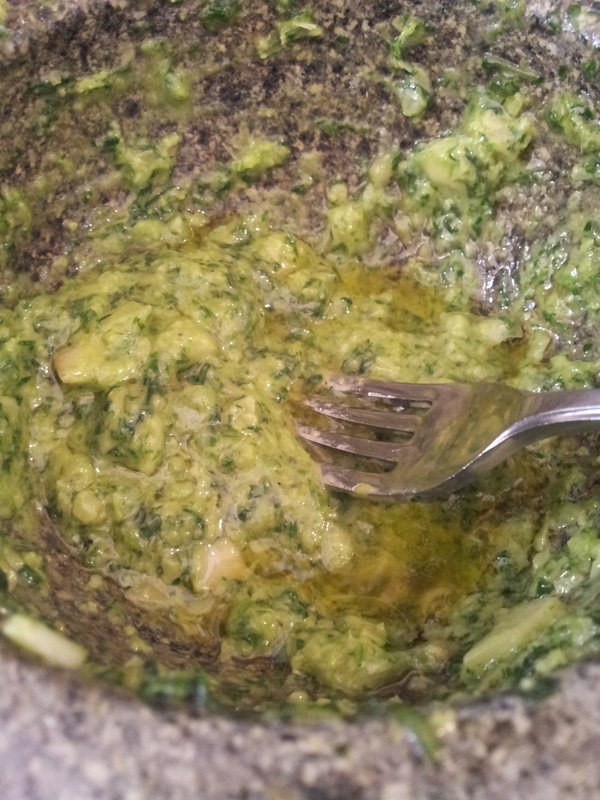 Lemon also serves to retain a bright green colour in the pesto. As we didn’t have any lemons, I used one slice of Heather’s homemade preserved lemon. This turned out to be a great addition. I really enjoyed the preserved lemon flavour. I set aside a couple of tablespoons of pesto for the dressing and put the remainder in a bowl for everyone to enjoy before dinner with crackers. For the dressing I dilute the pesto with olive oil. Always taste at this point. You might want to add a dash of vinegar but the preserved lemon made the dressing acid enough for this salad. Just before serving I drizzle the pesto dressing over the salad. Even though coriander is the major flavour for this salad I couldn’t resist using some amethyst basil from the garden and placed some tiny whole cherry tomatoes in and around the cheese. 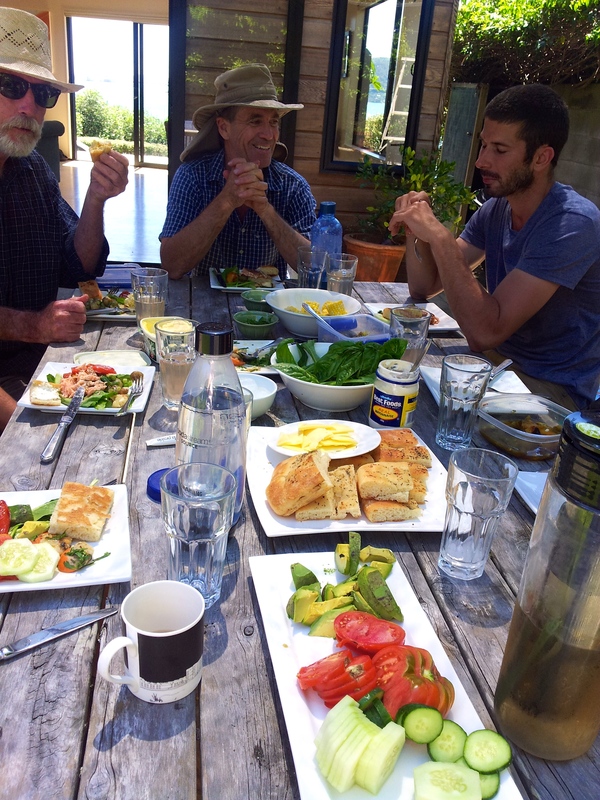 The salad complemented a Maori potato salad with chopped spring onions and local extra virgin unfiltered olive oil from Pataua Olive Grove, and the sweet and juicy sweetcorn purchased from a local roadside stall. 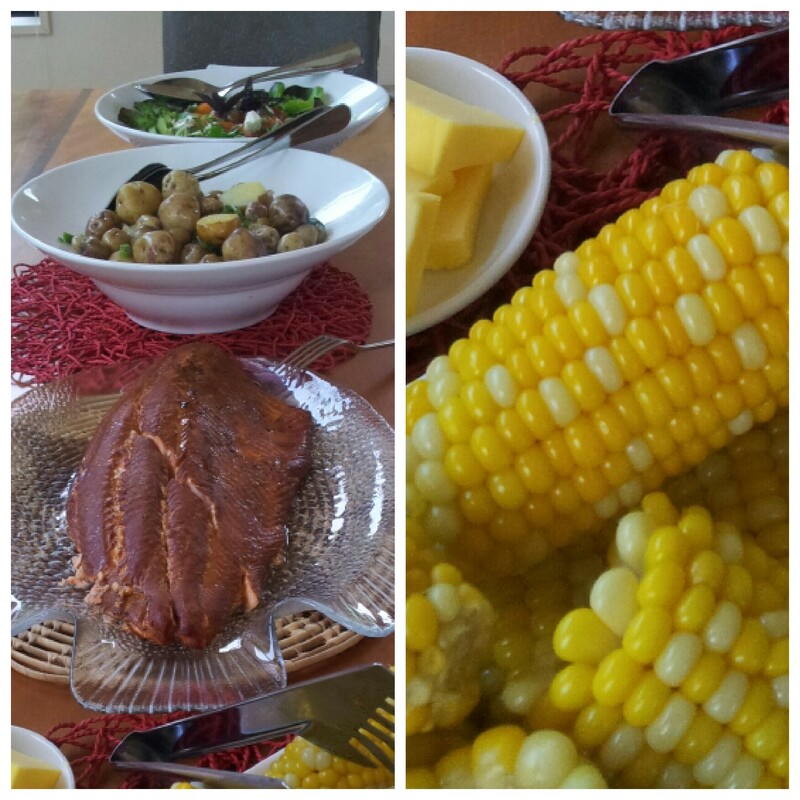 Martin was in charge of producing the hot smoked salmon making this meal truly memorable. Talk of scallops in the bay became a challenge for Peter. It was decided tomorrow when the tide is right he and Martin would attempt to free dive for scallops. She has tried a number of ways of cooking them but prefers this simple and quick method that showcases the flavour of the fresh scallops. Melt a dollop of butter and add chopped garlic (how much is up to your preference) and a couple of kaffir lime leaves sliced. 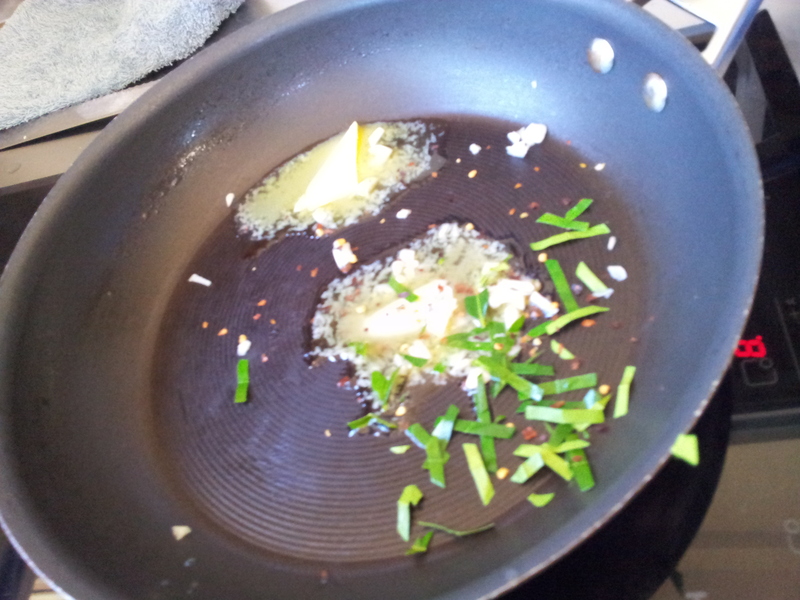 Saute slowly so as not to burn the garlic and butter. Turn up the heat and throw in the scallops. The scallops are cooked and taken off the heat when the colour of the muscle goes from slightly translucent to creamy white. 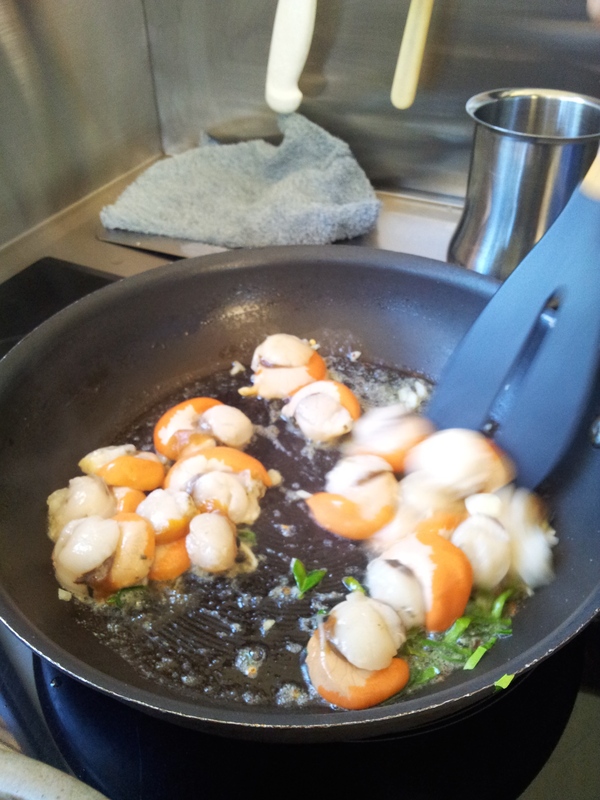 They take less than 5 minutes but it depends on the condition of the scallop and how full the pan is. 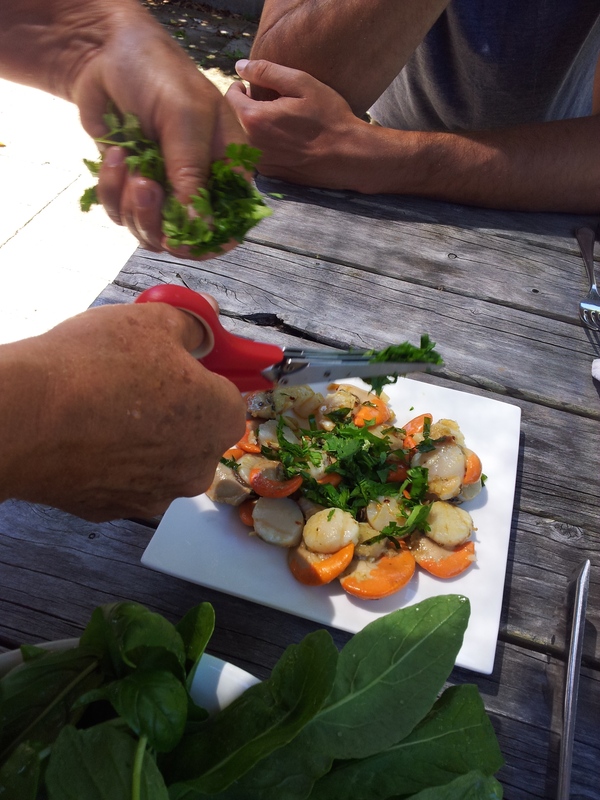 The finishing touch was some fresh coriander scissored on top of the scallops at the table. 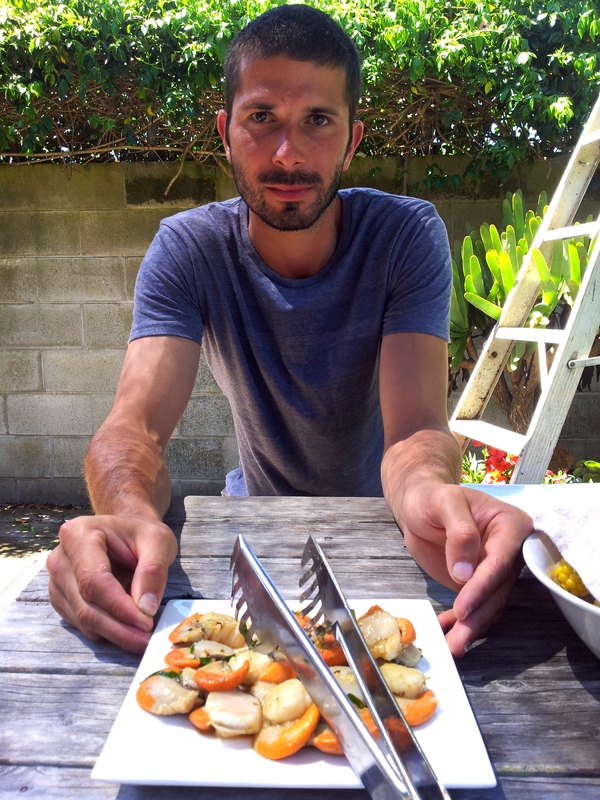 Yum… they were the most delicious scallops I have ever eaten. I think they were so good because they were alive half an hour before we ate. How privileged we are to still be able to harvest a meal from the sea. We only got a couple of scallops each but then a little of something lovely is sometimes more appreciated than a lot. 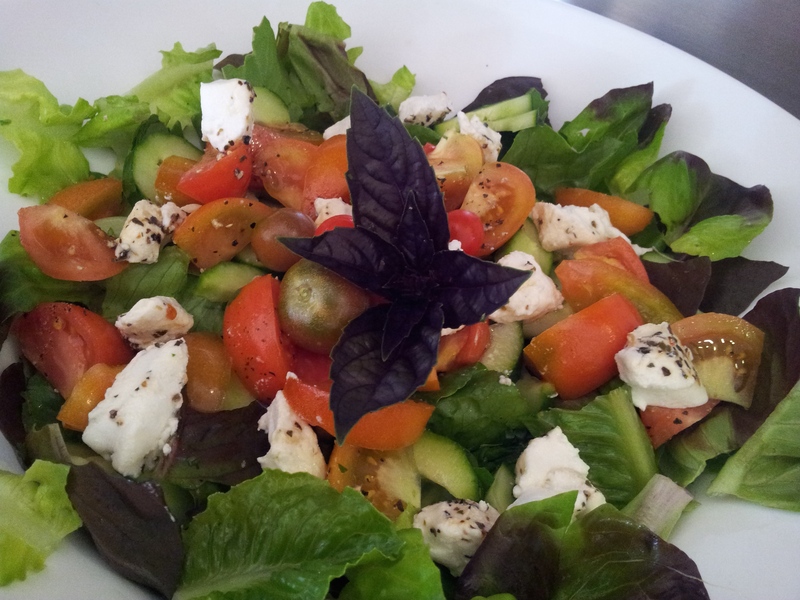 Besides we had plenty of fresh salad vegetables and the rest of the Buffalo Labneh balls to add to our lunch time feast. 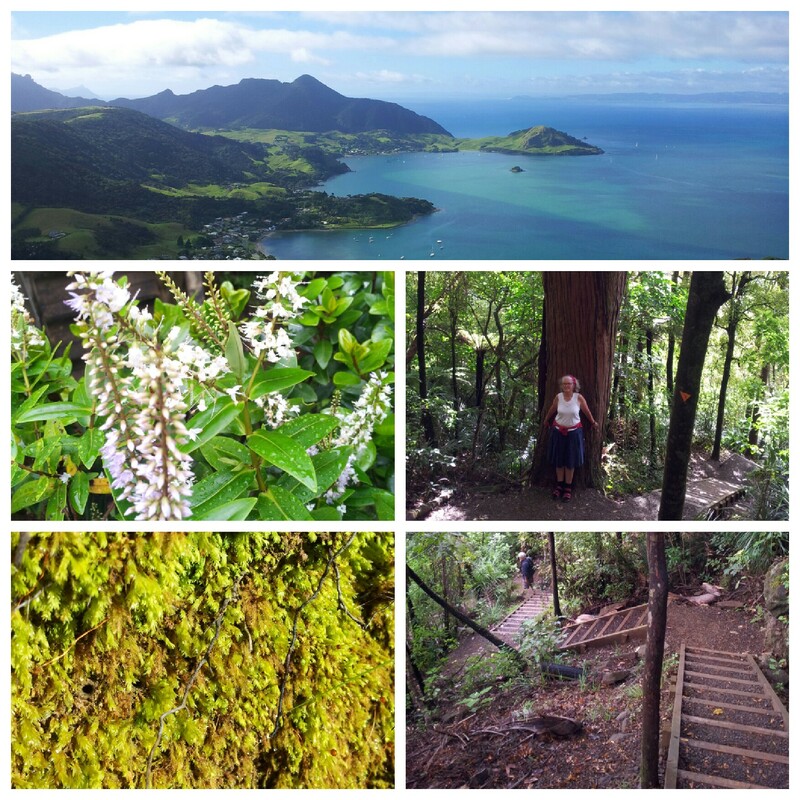 Martin and Heather live in a beautiful part of Northland and are a major force in the local community based Backyard Kiwi action group restoring kiwi numbers in the surrounding bush on Whangarei Heads. 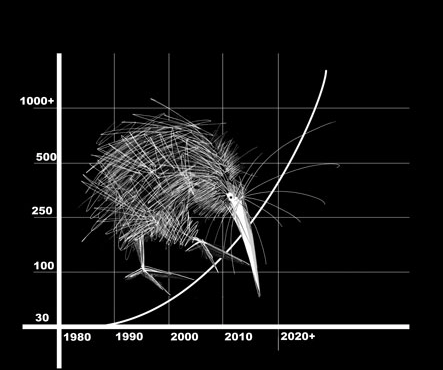 Backyard Kiwi aims to have kiwi thriving on Whangarei Heads for the grandchildren of today’s residents. 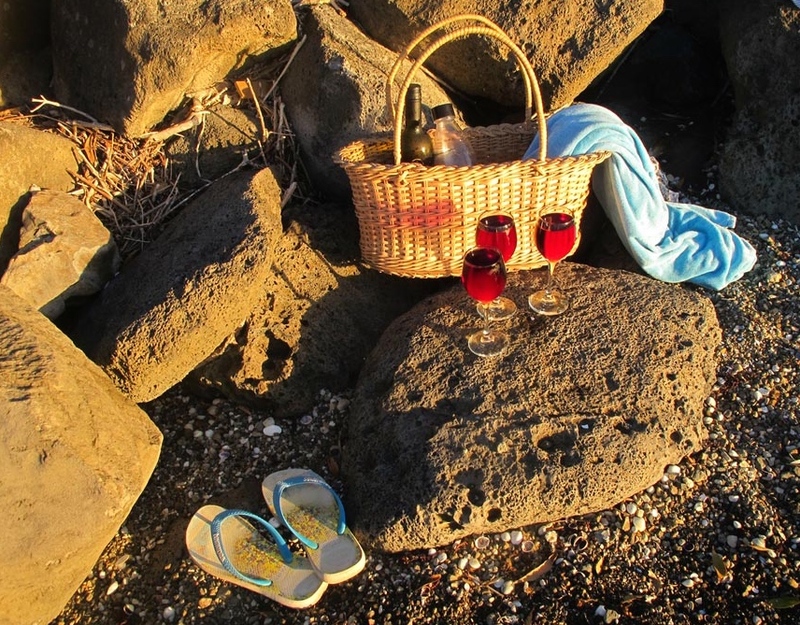 Managed by the Whangarei Heads Landcare group and through working with local residents this project has been so successful that the aim to have 1000 kiwis living on the peninsula by 2020 looks like it will be exceeded. This has been one of the most successful kiwi breeding operations in the country and it has been completely reliant on the skills and passion of local residents to save their kiwis. 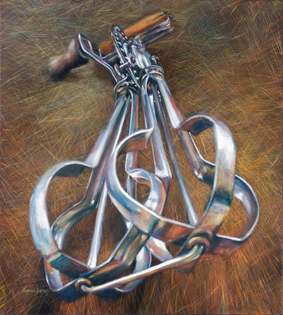 Heather’s an artist and she generously allowed me to use the image that she painted of her Swift Whip eggbeater for my blog. She illustrates children’s picture books and her drawings have really captured the personality of the kiwi. You can see her work at this link Heather Hunt.